1) In houses with fogging nozzles, make sure temperature sensors are protected from moisture. When a temperature sensor becomes evenly slightly damp, it will tend to indicate that the house temperature is in the mid-seventies. This can lead to tunnel fans shutting off prematurely. 2) A good indicator that your pads require cleaning is that the static pressure increases more than 0.01" when water is circulating over the pads. 3) During hot weather, the temperature difference between the pad and fan ends of a house when all fans are operating should be between 3 and 5oF during the last week of the flock. Greater temperature differences are typically the result of either insufficient tunnel fan capacity or indicates the fans are in need of maintenance. 4) Tunnel door openings can typically be 20% smaller than the pad opening without significantly affecting the air-moving capacity of the fans. The reduced tunnel door opening will tend to increase the level of air movement in the tunnel inlet area, which can increase both bird cooling and litter drying. The best way to determine if your reduced tunnel door opening is significantly adversely affecting fan performance is by monitoring static pressure. If the pressure increases less than 0.02" when partially closing the tunnel doors, you are not significantly decreasing fan performance or wind speed. 5) Fan shutters that do not open fully could be a sign that they are either dirty or the pressure is excessive. If the shutter opening decreases as the number of fans operating increases, this indicates that the increasing static pressure is reducing the air-moving capacity of the fans and the pads are likely in need of cleaning. If the shutter remains partially open regardless of the number of fans operating, this is a sign that the shutters require cleaning. 6) In the typical 40' X 500' house, if you can only obtain a static pressure of 0.05" when conducting a static pressure test with a sinlge tunnel fan it indicates that you are pulling over 23,000 cfm through cracks that could be coming through the evaporative cooling pads. If you obtain a static pressure of 0.20" or greater you are pulling less than 7,000 cfm through cracks and you maximizing both air cooling and wind speed. 7) The best location to evaluate the air speed in a tunnel ventilated house is 5 - 10' from the side wall. This location is more representative of the air speed most of the birds are receiving than measurements taken in the center of the house. The fact is if you have an air speed of 600 ft/min in the center of the house you can still have problems on hot days because the air speed near the side wall can be significantly lower. But if you have an air speed of 600 ft/min 5 - 10' from the side wall, chances are all the birds are receiving sufficient cooling. 8) Air velocity measurements should generally not be taken at bird level. Air velocity measurements taken at bird level can vary over 100 ft/min or more depending on the level of bird activity in the area where the measurement is taken. More consistent/reliable measurements will be obtained when you measure air speed approximately 4' to 5' above the floor. 9) Fan circuit breakers should feel warm to the touch, not hot. It is normal for the temperature of a circuit breaker to run 5 to 10oF above room temperature. If it is hot to touch (ie 110oF+) it is typically an indicator that the circuit is overloaded or that wire connections are loose. 10) A quick way to check to see if you have belt wear issues is to, after cleaning a house’s tunnel fans, replace one belt. Next, with the house closed up, turn on the fan and check the static pressure. Now turn on a different fan and check the static pressure. If the pressure decreases it means that the fan is moving less air than the fan with the replaced belt and its belt should be replaced. Repeat this procedure for all the tunnel fans in the house. 11) Over the years a fan belt can wear down a motor pulley, making it wider. The wider the groove in the motor pulley becomes, the lower the belt will ride in the motor pulley, the slower the fan will spin, the less air it will move. If the motor pulley has a mirror-like finish or after replacing a fan belt it sits even or below the edge of motor pulley, chances are you need to replace the motor pulley. 12) Controller temperature sensors should ideally be located approximately 10' from the side walls, especially in curtain-sided houses. Placing temperature sensors in the center of the house where air velocities are the highest and temperatures tend to be at their lowest can result in heat-stressed birds near the side walls. 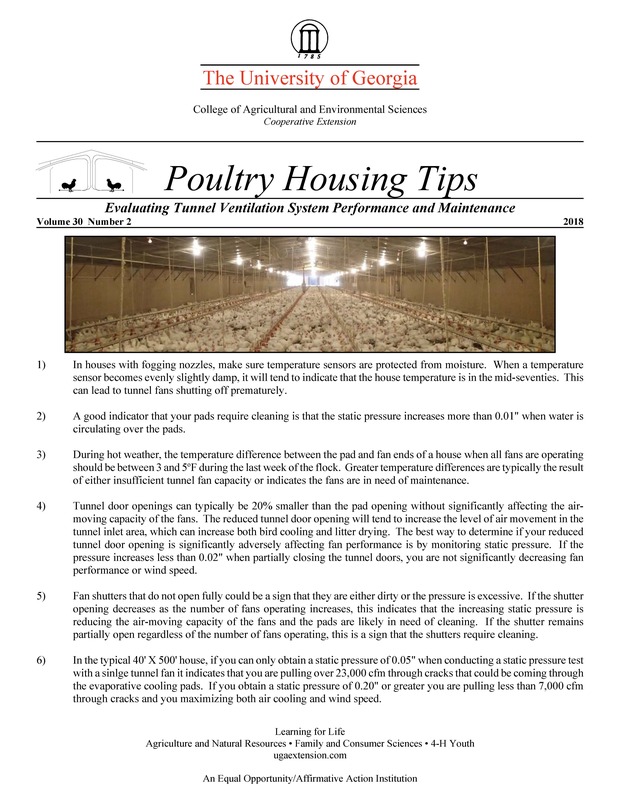 The cooler temperatures in the center of the house can result in tunnel fans not operating as much as they should to insure that the birds near the side walls are receiving adequate cooling. It is important to realize that the birds within 10' of the side walls account for half the birds in a 40' wide house. 500 ft/min = 0.10" - 0.12"
600 ft/min = 0.12" - 0.15"
700 ft/min = 0.15" - 0.18"
800 ft/min = 0.18" - 0.21"
It is important to realize that in a tunnel ventilated house the pressure will increase as you move from the pads to the fans. To obtain the true static pressure the tunnel fans are working against it is best to make measurements within 20' of the tunnel fans. 14) In order to minimize algae growth and mineral build-up on pad surfaces it is important to keep the water in the pad system as clean as possible. This can be best accomplished by simply dumping all the water in the system weekly. Though this may feel like you are wasting a lot of water, the fact is that it will typically only increase weekly house water usage by one or two percent.